4. Your bonus will be credited instantly via Live Chat or within 24hrs of emailing support. The £5 free bonus is available only to new players that have had no previous 10Bet registration and have not claimed the Welcome bonus. To claim your €/$5 free you should contact our customer service via chat or email and ask for the “No Deposit Bonus”. 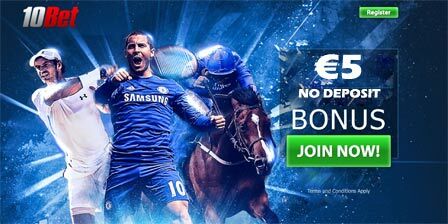 Your free bonus can be used in Sportsbook only. Players must deposit at least £50 with the bonus code FD100 for the First Deposit Bonus promoted on the web site and complete its roll-over requirements in order to withdraw any generated winnings. The maximum amount that can be ultimately withdrawn from the £5 free bonus campaign is £50. The free bonus is available in different currencies - e.g. : $5, €5, CAD 5, AUD 5, SEK 50, etc. 10Bet reserves the right to cancel the bonus and any winnings in case of deliberate duplicate accounts registration for the sole purpose of this bonus claim. Players from UK, Armenia, Belarus, Croatia, Czech Republic, Kosovo, Latvia, Macedonia, Poland, Romania, Serbia, Brazil, Bangladesh, Tunisia, India and Ukraine are not eligible for this offer. All 10Bet bonuses and promotions are intended for recreational players only and 10Bet may in their sole discretion limit the eligibility of customers to participate in all or a part of any promotion. "€/$5 no deposit free bet on www.10bet.com! (no bonus code needed)"